Suggested Use: 1 to 2 tablets twice daily or as directed by a health care professional. Vinpocetine is derived from alkaloids found in periwinkles (the little blue flowers of the genus Vinca, not the little snails also called “periwinkles”). Discovered in Hungary in 1976, vinpocetine’s value for treating brain disorders was quickly appreciated in Eastern Europe but was only slowly realized elsewhere. Consequently, most of the clinical research into vinpocetine has been done in Hungary, Russia, and Poland. Accordingly, we will limit our discussion of Vinpocetine to a brief summary of relevant research, and let you draw your own conclusions about what medical conditions it may be effective in treating. Early interest in vinpocetine centered on its ability to improve mental function in patients with poor blood circulation in the brain. For example, Bulgarian researchers in 1976 reported that when vinpocetine (5 mg three times/day for a month) was given to patients with Chronic Cerebral Vascular Insufficiency, blood flow in the cerebral tissue was markedly increased, without increasing blood pressure or having any other side-effects. Let us look briefly at several of these interesting applications. Glaucoma is the second leading cause of blindness worldwide, and is the leading cause among African-Americans. It is called “the silent thief of sight" because it progresses slowly and is often only recognized when the disease is advanced.27 Vinpocetine will not restore vision loss that has already occurred, but it appears to be worthwhile insurance against glaucoma’s onset. These four types of damage to the brain have different origins, but they all cause tissue damage through inflammation.8,29 Methods for suppressing this inflammation are therefore important for treating these conditions. Vinpocetine is strongly anti-inflammatory and operates by a different mechanism than most other inflammation suppressors30 — and this may account for its remarkable lack of side effects as compared with other anti-inflammatories. The use of vinpocetine as an anti-inflammatory for dealing with these brain conditions is new idea. No clinical studies have yet been performed (as of early 2011) to test this idea. Should people with Alzheimer’s, Parkinson’s, ALS, or stroke be using vinpocetine in the hope that it will have benefits not yet proven? 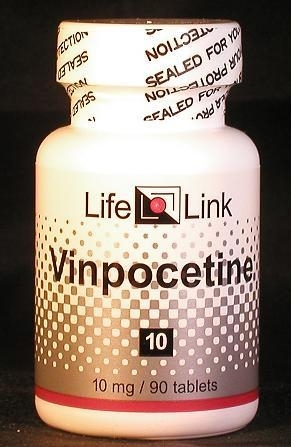 In view of vinpocetine’s safety and effectiveness for other conditions, it would be hard to justify waiting who-knows-how-many years for the medical world to decide the question scientifically. As is often the case in the medical world, the promising results of one or two clinical studies were never followed up by other investigators. However, it is easy enough for tinnitus sufferers to try vinpocetine themselves before opting for one of the risky treatments offered by the medical profession. We found the 2002 review7 by Thorne Research to be useful. Are Vinpocetine supplements useful for the conditions and purposes mentioned above? We aren’t allowed to tell you, so you should take a look at some of the references cited here, and then decide for yourself. Since vinpocetine improves memory and cognition in ailing individuals, many perfectly healthy people conclude that it should help them, too — an idea that makes a lot of sense and is supported by the experiences of its many users.